Come Join Us for Game Show Night at PAX! A few months ago, I got some friends together at PAX East and hosted the Blankety Blank Panel, modeled after the classic 70s game show, Match Game. It was a whole lot of fun, and taught us, among other things, the term "under-bridge American." So we're going to do it all again at PAX Prime, but this time, the wonderful Dan Amrich and Chris Kohler are hosting shows, too! We surveyed 100 gamers ... can you guess their responses? Everybody's favorite game show about families getting into arguments on television and husbands just having to smile and nod as Richard Dawson makes out with their wives is now a live PAX show. Random audience members will be organized into impromptu families and pitted against other audience members. Guess the most popular answers to our questions and you'll win fabulous prizes! Can you read Major Nelson's mind based on a one-word clue? Find out as we play the classic TV game show Super Password live on stage - it's Super PAXword, of course! 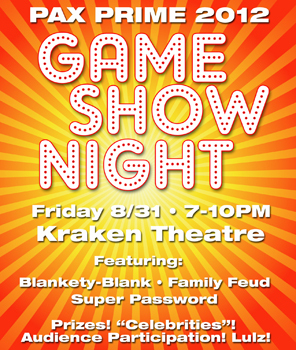 Our celebrity guests - Sid Shuman from Sony and Larry Hryb from Microsoft -- will join players pulled from the audience as they try to solve the cryptic clues and metapuzzles together for fun and crappy prizes. I promise laughs, shenanigans, and extended periods of frivolity. The possibility of cookies is high, the probability of pants is relatively low. So come join us!